Across the Canadian cannabis industry, promise and plans are turning to execution and reality. Producers that have been largely valued on potential are bringing production capacity online and reporting revenue numbers. As the market matures, investors and analysts will be taking a hard look at which companies are delivering on expectations and which are not. MediPharm Labs (TSXV: LABS) (OTCQB: MLCPF) is an example of a company that is executing on its unique oils-and-extracts focused business model, converting flower to crude cannabis oil and further transforming into the highest quality “patient-ready products” in the final mile of the supply chain. It’s a young venture but is already tracking ahead of some of the more well-known cannabis companies. While many of the largest licensed producers have been primarily focused on increasing space for growing cannabis, MediPharm has set its sights from inception on the specialized, lucrative and expanding oils and extracts segment of the supply chain. In fact, it is the first company to receive a license to produce oils from Health Canada without first receiving a cultivation license. By entering into supply agreements with 13 growers (and negotiating/finalizing additional agreements with several other Licensed Producers), MediPharm has ensured a steady supply of dried flower to feed its extraction operation, and to ensure cannabis oil inventory for its processing partners. 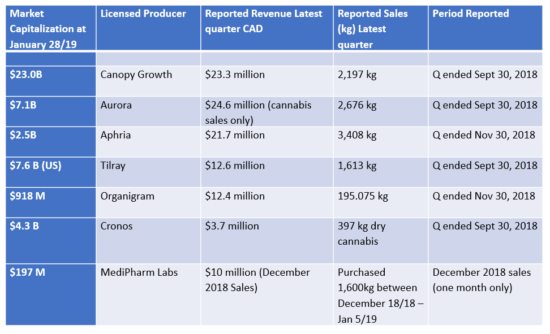 Of note, are multi-year agreements with Canopy Growth Corporation (TSE: WEED)(NYSE: CGC); James E. Wagner Cultivation Corporation (TSXV: JWCA); INDIVA Limited (TSXV: NDVA); Newstrike Brands Ltd. (TSXV: HIP); Emerald Health Therapeutics Inc. (TSXV: EMH – OTCQX: EMHTF); The Supreme Cannabis Company, Inc. (TSXV: FIRE)(OTCQX: SPRWF) (FRA:53S1); and TerrAscend Corp. (CSE: TER; OTCQX: TRSSF). The company recently expanded oil production capacity as well, announcing Health Canada’s approval of two new extraction lines. MediPharm’s total of five extraction lines can now process up to 150,000 kg of dried cannabis annually, which results in a total of 23,400 litres of cannabis resin annually. For perspective, that is enough annual production capacity to fill more than 29 million vape pens cartridges. Or, enough to supply about 1/12th of Canada’s total annual oil sales at current levels reported by Health Canada. By the end of Q2 2019, MediPharm expects to complete its Phase 2 expansion, upping extraction capacity further to an expected 250,000 kg of dried cannabis annually. In addition to this expanded capacity for primary extraction, MediPharm Labs is also building its breadth of offerings to include commercial-scale tincture bottles, gel caps and capsules in a GMP environment. Most noteworthy is its leading secondary processing of cannabinoid isolates for advanced derivative products; through the use of chromatography, MediPharm Labs is able to target and separate main cannabinoids (THC and CBD) as well as minor or novel cannabinoids such as THCV, CBG or CBN for advanced formulations. MediPharm Labs does not appear to be satisfied with operating solely in the Canadian market. Its subsidiary, MediPharm Labs Australia, has applied to extract and import medical cannabis products in that country. MediPharm Labs Australia will be an import-export hub for cannabis oil, providing the company additional access to oil supply and the ability to service Asia Pacific markets. The Australian operation is modeled closely on the company’s Canadian facility, which is designed and built to operate in compliance with European current Good Manufacturing Practices. These European cGMP guidelines are the strictest in the world, ensuring that MediPharm’s products will meet the requirements of virtually any jurisdictional regulatory environment, providing major growth prospects. The company recently became a member of the Global Cannabis Partnership, an organization committed to establishing the highest standards for the cannabis industry across the globe. It’s a fertile ground for ideas and partnerships, and demonstrates MediPharm’s commitment to quality and accountability while positioning the company as a global leader. Additionally, MediPharm is involved in several international research and development collaboration projects involving proprietary, patentable technology. MediPharm Labs’ approach looks to be both measured and forward-looking. During a time when the industry was focused on flower cultivation, MediPharm was making preparations for its unique business model, staking a leadership role in the next phase of the industry – oils, extracts, and derivative products. The company is now focused on generating revenue in Canada quickly, and its first month of sales is an indication that the plan is working. At the same time, MediPharm is seeing the larger picture and working toward a global presence, building off its experience as a Canadian pioneer in the young legal cannabis industry. The pace of developments for the company is fast and furious, but it all appears to be part of a well-considered plan. This is definitely a company to watch and it will be interesting to see what’s next for this extraction frontrunner.